Star Trek seems, in many ways, anathema to the modern blockbuster environment into which its been rebooted. The series, which prized intellectualism, exploration, and the common good was brought back into a summer movie environment - and, in some ways, an America - that prized go-with-the-gut strongmen who were above any law their might could crush, and the series first two entries (the charming-ish Star Trek and the truly dire Star Trek Into Darkness) reflected that ethos in its entirety. Kirk was a vapid prettyboy who stole command because he could working against a corrupt and inefficient Starfleet, and the rest of the cast, well, they mostly existed because they did in the original series, and because someone needed to drop one-liners when Kirk couldn't. All of which is to say: Star Trek Beyond had a lot of problems going into it. Thankfully, it isn't just good, it's the best Star Trek film in over two decades. Booting toxic screenwriters Roberto Orci and Alex Kurtzman and blessedly relegating J.J. Abrams to producer, Beyond lets series star Simon Pegg join Doug Jung on the script, and brings in frequent Fast & Furious director Justin Lin. Pegg, Jung, and Lin bring the sense of exploration, danger, and optimism that defined the show back to the films. Finally, a Star Trek film that feels like Star Trek again. The premise is this: The Enterprise, in the midst of its exploratory voyage into deep space, rests at a space station serving to mark the very edge of Federation space. There, they get word that a scientific vessel has been damaged, its crew stranded on a planet in an unexplored nebula, and the Enterprise is asked to lead the rescue mission. But when they reach the planet, they find themselves under attack from a species they've never before encountered, who seem to have an intimate familiarity with the Federation and its operations. The Enterprise crashes, and its up to the surviving crew to figure out how to get off the planet and stop the mysterious Krall from using an ancient superweapon on the settlers of the space station. If this sounds like a beefed up episode of the original Star Trek TV series, well, you aren't far off, because it feels a lot like that too. The premise is straight out of a Western, befitting the old 'Wagon Train to the Stars' pitch Roddenberry originally made, as the very edges of deep space begin to push back against the expansionist Federation. But there's a lot of Guardians of the Galaxy here too as Lin plays a lot with color and sound in a way that makes the movie frankly gorgeous to look at. But while a lot of the structure and design borrows from Guardians, I think this film is vastly superior in terms of design. Yorktown, the deep space outpost we begin and end the film on, is a beautifully designed science fiction marvel, casually playing with gravity and scale in ways that I found both interesting and aesthetically pleasing. The crew is back, and, I think, with more to do. Uhura (Zoe Saldana) doesn't really get a full story of her own here, the way Spock (Zachary Quinto), Kirk (Chris Pine), and Bones (Karl Urban) do, but what story she does have is, at least, pretty much completely dissociated from her romance to Spock for once. Sulu (John Cho) gets a couple small moments to shine but otherwise spends much of the time on the sidelines. Checkov (the late Anton Yelchin) does get a bit more to do, at least, in his final appearance as the character, and Pegg's Scotty once again has a fairly major role. But a lot of attention gets paid to new character Jaylah (Sofia Boutella) and villain Krall (Idris Elba), each of whom have their own arcs and backstories, and it was nice to get some really solid new blood in the series after Into Darkness. Of the two, Jaylah's striking design and Boutella's defensive, curious performance stood out the most, but Elba brought a fair bit of depth to his wounded warrior, hampered a bit by ungainly make-up effects. And Pine was finally given something to play other than callowness as he tries to figure out what his mission means to him, bringing a little soulfulness to one of the least reflective modern blockbuster leads. While I love the movie, it certainly isn't perfect. While Justin Lin has plenty of experience with action, here he struggles to make the hand-to-hand combat as interesting as the (excellent) space battles. The ship-to-ship fights are frenetic but clean, beautifully organized and thrilling, but as soon as fists and phasers start flying, Lin gets in so tight it's all but impossible to tell who is doing what. While this is only a problem a couple times, those moments where the action closes in mistake 'hard to follow' for 'exciting', and often a fair bit of momentum gets lost. The action of Star Trek Beyond is stronger for its sense of design (the drone fleet is gorgeous and alien) and consequence (the destruction wrought on the Enterprise is surprisingly harrowing, and Lin smartly returns to explore that damage more than once), and for its CGI space battles than for the requisite cramped hallway fight scenes. More importantly, though, I think that the conflict at the end avoids the complicated denouement it had set up for something easier, and less interesting. It's a small moment very near the end, but a vital one given some of the thematic content it had been setting up initially. The film is mostly very good about setting up its core ideas and exploring them vividly, but the rigors of action filmmaking - and demand for a tidy ending - do cause it to slip up in its final minutes. As I watched Star Trek Beyond, Donald Trump was officially accepting the Republican Party's Presidential nomination in the RNC in Cleveland. It can be easy to mistake the optimism of Star Trek Beyond for naivety as a major American political party nominates an anti-intellectual white supremacist strongman. I do not believe that for a second. Art can reflect the darkest parts of our lives and history, yes; the bleak amorality of Game of Thrones or Hard To Be A God seek to do just that. But that's not realism, it's cynicism, and it's not the whole story. Because just one day before I saw Star Trek Beyond, one day before Trump spoke, NASA released a batch of 1300 pictures taken from a probe on Jupiter, more than 350 million miles away. There are still brilliant women and men exploring the furthest reaches of space, not for profit, but for knowledge. For the betterment of all mankind. What we miss when we dismiss the art of optimism are that these stories are just as real, and just as vital, as the dark ones. Star Trek Beyond pits multicultural intellectualism against authoritarian warmongering, and makes a stirring case for working together and not just sliding reluctantly into an unknown future, but diving towards it. 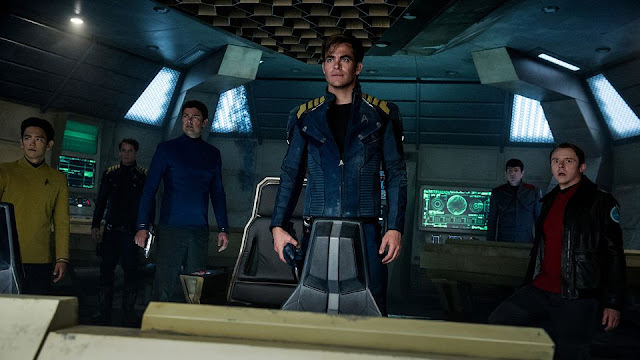 Star Trek Beyond is a summer blockbuster, with all the pitfalls that suggests to many viewers, but I would argue that it is also more than that: Star Trek Beyond is a statement of purpose. It's clear-eyed about the dangers we face going forward, but it's nothing that can't be defeated with some jury rigged science, some trusted friends, and a great song. Star Trek Beyond is out now in theaters everywhere. Written by Doug Jung and Simon Pegg and directed by Justin Lin, Star Trek Beyond stars Chris Pine, Zachary Quinto, and Idris Elba.